A study has revealed the impact of one single chiropractic adjustment on the human nervous system. Chiropractic care has been thought of as a treatment for pain related disorders only. However, new research is beginning to shed light as to why it’s so beneficial when someone hurts. Chiropractic care is all about removing interference within the body. Anything that interferes with your brains ability to maintain optimal function will result in disease. Recently, scientists were able to take a radioactive analogue of glucose as a marker to measure brain glucose consumption as it would indicate brain metabolic activity after a chiropractic adjustment. Their findings were AMAZING! 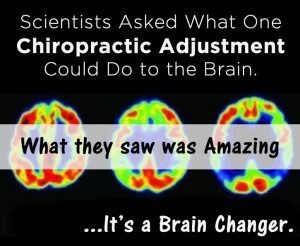 8 PhD’s and 1 Chiropractor took several participants and scanned their brains Before and After a Chiropractic Adjustment. What they found next was astonishing! All the patients who received a chiropractic adjustment showed a decrease in parts of the brain related to increased stress levels. Specifically, sympathetic tone was inhibited, salivary amylase was decreased (indicating a decrease in fight/flight physiology), regional brain metabolic changes occurred, and muscle tone & pain intensity decreased following ONE single chiropractic adjustment. This modern study supports the link between chiropractic care including chiropractic adjustments and limbic emotional function based on the changes noted by the PET brain scans. This brings to life the power of a chiropractic adjustment and its proven effect on human physiology. 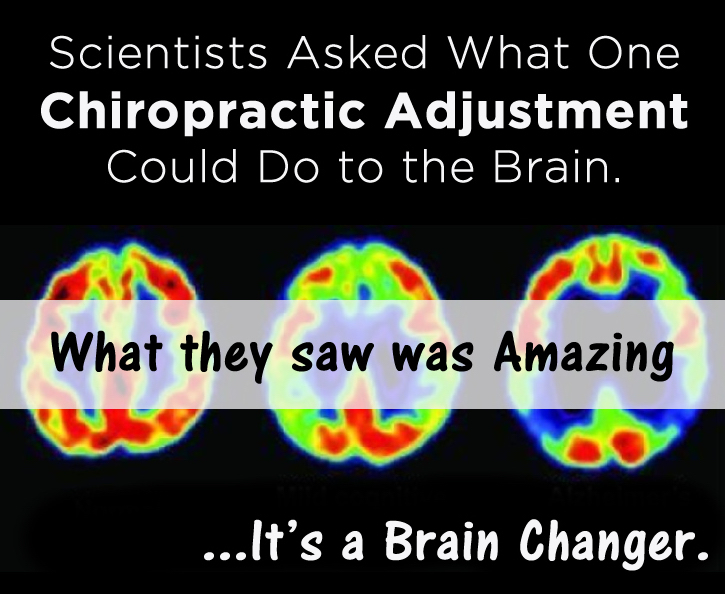 This study indicates that chiropractic adjustments impact the function of the prefrontal cortex. The prefrontal cortex is the area in the brain where higher learning and cognition happen. “The latest study suggests that the changes that we do see in the brain when we adjust the spine do occur in the prefrontal cortex. That part of the brain is like the conductor,” said Dr. Haavik. The question to ask now is this: what might this mean for chiropractic and for health in general? If the research is correct in suggesting adjustments improve prefrontal cortex activity, what role might chiropractic play in improving the functions controlled by this part of the brain? Many chiropractors are sharing their thoughts on this study, like this example. Further research is needed to explore this area and to answer the questions posed by this study. Manipulation of Dysfunctional Spinal Joints Affects Sensorimotor Integration in the Prefrontal Cortex: A Brain Source Localization Study.Lelic D, Niazi IK, Holt K, Jochumsen M, Dremstrup K, Yielder P, Murphy B, Drewes AM, Haavik H.Neural Plast. 2016;2016:3704964. doi: 10.1155/2016/3704964. Epub 2016 Mar 7. Ogura T, Tashiro M, Masud M, Watanuki S, et al. Cerebral metabolic changes in men after chiropractic spinal manipulation for Neck Pain. Alternative Therapies 2011;17(6):12-7.